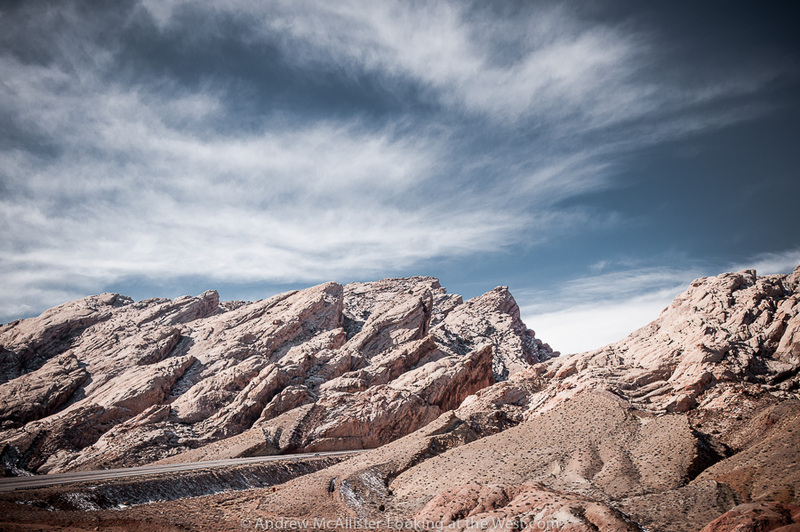 Above: I-70 road cut at the San Rafael Reef in Southern Utah. To avoid a snow storm on Soldier Summit I decided to take I-70 for my return route from Moab last month. What a good decision it was. The San Rafael Reef is visible from my usual route (Utah 191 from Price) but I had never been this close. If you are traveling I-70 through this area plan extra time to stop at all of the scenic overlooks, they are well worth it. 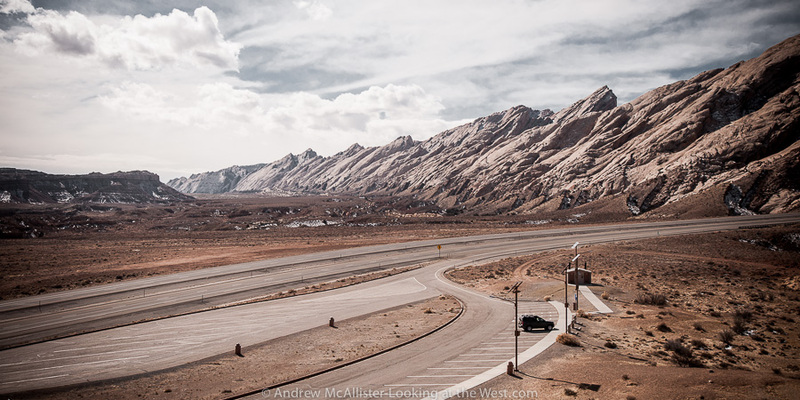 Taking this route greatly expanded my desire to explore Southern Utah. Expect more information and photos from this amazing part of the state. Above: Detail of the road cut at the San Rafael Reef. Didactics at the rest area explain the massive project to widen a slot canyon into the modern highway we travel today. Above: I-70 Rest Area at the base of the San Rafael Reef. Photographers would be crazy not to stop. 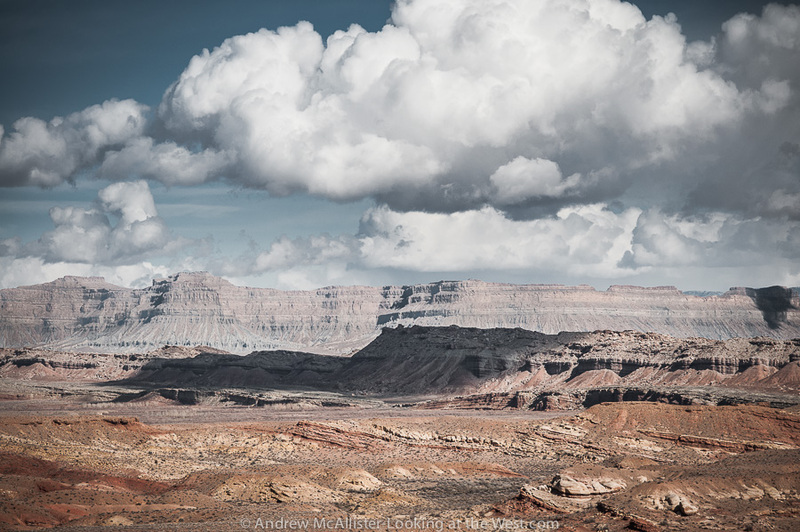 Above: Looking toward the Book Cliffs from the San Rafael Reef. How many of you have been to this part of Southern Utah? AMAZEBalls… I like that. Thanks for looking and commenting. I have taken this route many times, a beautiful alternative to 80 when crossing the country, and one of the few interstate highways I still take. I am stuck at home for the next few months however, so thanks for bringing images of some of my favorite places in the west to my screen this morning! My pleasure. Glad you liked them. I’ll be posting a few more in the coming days. It’s amazing there, one of my favorite areas on earth. Fantastic photos! Breathtaking landscape – so vast and impressive. Here I would like to go! I always appreciate the inclusion of roads in your images. It may be counter-intuitive, but the roads accentuate the drama of the landscape and clarify its scale. Thanks for posting, heading to the Reef/Swell in a few weeks – such a beautiful area. Nice shots! Enjoy your trip. I enjoyed looking at your blog, cute dogs! Fabulous photos! The sky is is so free and soft compared to the rigidity of the rock formation. Just beautiful. What a stunning vista… Such beautiful images. Magnificent photos, such clarity and beauty.